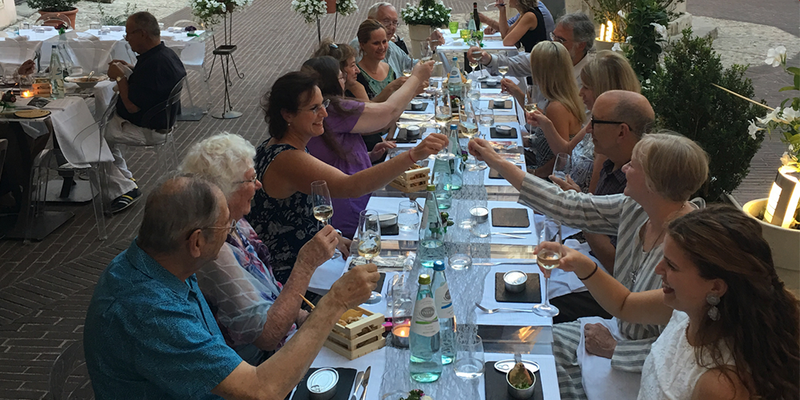 In July, Meany Center friends enjoyed seven beautiful days in Umbria to discover the Spoleto Festival, a well-known international festival set in the ancient Italian hill town of Spoleto. Spoleto has a rich history, with settlements of the Umbri tribes going back as early as the 5th century B.C., transitioning to a Latin colony, then becoming part of the Roman Empire, and was under the authority of the Papal States, until 1860, with the unification of Italy (Napolean had a brief stint ruling Umbria as well in the early 1800s). In comparison to the long history of Spoleto, the festival founded by the composer Juan Carlo Menotti in 1958, celebrated its 60th anniversary in style with performances of dance, theater, music, film, lectures, visual arts and educational events. Set against a steep hillside, with a Roman fortress sitting atop, the town has numerous historical venues for arts events – gorgeous churches, indoor theaters, an outdoor Roman amphitheater, stage in front of the main Duomo, and many temporary spaces created for the festival. Nothing quite prepared us for the breathtaking experiences that we would have, such as hearing music in a Romanesque church, with light streaming in through stained glass, or experiencing contemporary dance in a Roman Amphitheater with a warm evening breeze billowing through dancers hair. Our experiences of the grace and intimacy of these historical spaces, coupled with timeless artistry, are truly numerous and varied across the many different performances we all attended. Enjoying a meal al fresco with good company. We traveled in a group of about fourteen music, dance and theater lovers from Seattle – friends of Meany – and traveled together North from the Rome airport through the beautiful countryside of olive groves, vineyards, country houses, sunflower fields, churches and rolling hills to our home base in Spoleto’s San Luca Hotel, a charming and perfectly located in at the base of town. Our first meals together set the very high bar for a multi-day series of four and sometimes five course meals that were out of this world – antipasti of fresh buffalo mozzarella and vine ripened tomatoes, basil, and the best olive oil anywhere in the world; fabulous prosciutto and ripe melon, some of the best spaghetti carbonara I have ever imagined, finely prepared meats (including rabbit) and seafood, and of course, gelato and desserts of every kind. Of course, there were fine wines of the region, to be enjoyed over our long lunches and dinners every day. While I was very surprised after the extremely high numbers of tourists in Rome, I was also surprised that Spoleto was very untouristed, quiet, and had a very local feel. The festival itself is seemingly geared for Italians. The pace was slow, with multiple generations were out and about everywhere, although the evenings were the busiest – when the hot July sun had set and the temperate evenings invited everyone to come together in the streets of the town. Starting on our second day in Spoleto, we were joined by a very knowledgeable guide, who was our companion throughout the trip. 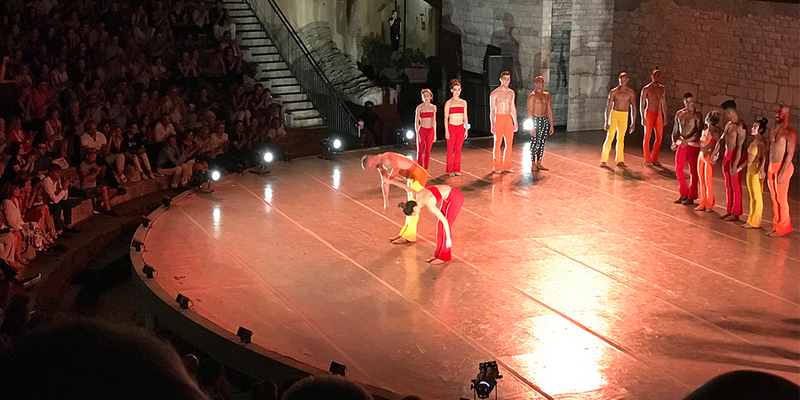 With her, we explored the landmarks of old Spoleto, including a Roman Theater, where we would later see Brazil’s wonderful dance company Grupo Corpo perform Danca Sinfonica and Parabelo – both works that have been to Meany. One of my favorite performances of the entire trip was a world premiere opera based on Oscar Wilde’s A Study of Duty, with music by the composer Alberto Colla and performed by the Orchestra Talenti Musicali and produced with a cast, put together by the Fondazione Teatro Coccia di Novara. Our next day included a visit to the town of Orvieto and the magnificent Duomo there and purchasing some of the beautiful local ceramics of the region. A highlight of the trip was our visit to a real, working Umbrian castle Castello di Montegiove, that sits on over 3,000 acres and is both an active winery and farm. After tour of the wine-making facilities by its heir Lorenzo Misciatelli, we enjoyed a spectacular lunch and wines served by the entire family. Our fourth day brought more exploration – of the beautiful frescoes of the Palazzo Collicola and also a visit to composer Gian Carlo Menotti’s home – the Spoleto Festival’s founder. A small group even went to visit an organic farm, ate homemade pizza and toured the orchards and fields. I took the afternoon to see the great theater director Robert Wilson’s collaboration with the East German playwright Heiner Muller: Hamletmachine. An incredibly rare opportunity to see the work of such distinguished artists in a very small space. That evening, we all regrouped to attend string quartet concert – of Quartetto Adorno of Cremona. A woman demonstrates on a loom in Perugia. Our travels then brought us to Perugia the capital city of Umbria with history going back to the Etruscan period and where the University of Perugia was founded in 1308. 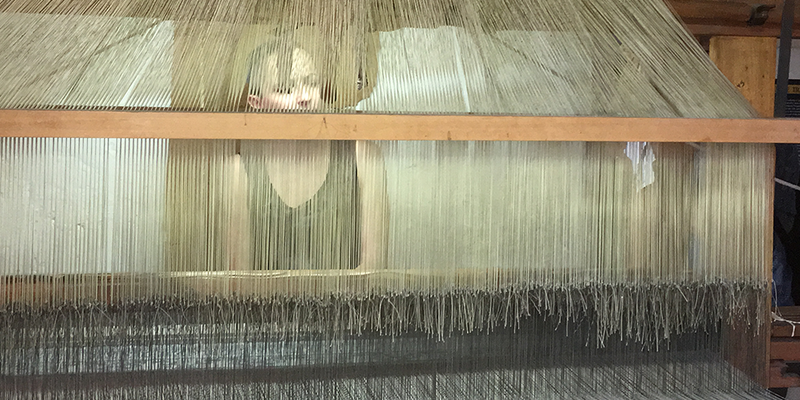 We visited one of the oldest textile shops in Italy – the Bronzetti atelier – and learned that the first computers were actually created for textile patterning – incredible. We visited the National Gallery of Art where we saw the spectacular works of Perugino and Pinturicchio, and walked along Perugia’s underground city – a buried medieval town underneath the 16th century fortress. We tasted Perugian chocolate, beer, and ate traditional Italian food of the area – truffles were used throughout Ubria to great effect, and I fell in love with the ripe and sweet tomatoes, high quality olive oil, salt, Buffalo mozzarella and basil salads that were everywhere. The following day included a tour of Spello, an ancient walled city that became a Roman colony in the 1st century B.C. where we explored the stunning Baglioni Chapel and the village sqaure. We then visited the quaint village of Bevagna, on the western branch of the Via Flaminia (road to Rome) which also has a rich Etruscan history. We even tasted wine at the Enoteca Properzio, with owner Roberto Angelini, and learned that Jeff Bezos had been a recent visitor and had sent local wines back to Seattle by the case-load. Of course, we couldn’t resist – both the wines and the olive oil (which is said to be the best in the world), and we sent some back to Seattle as well. My favorite meal of the trip was in a small restaurant Serpillo Torre del Colle where we ate an incredible range of antipasti, cheeses, pasta, meats and of course fabulous Umbrian wines. After a short bus ride back to Spoleto, we also attended our final festival performance – the guitarist Leopardo Giachetti, in the Church of Saint Eufemia, a 12th century Romanesque church where most of our chamber music performances where held throughout the festival. 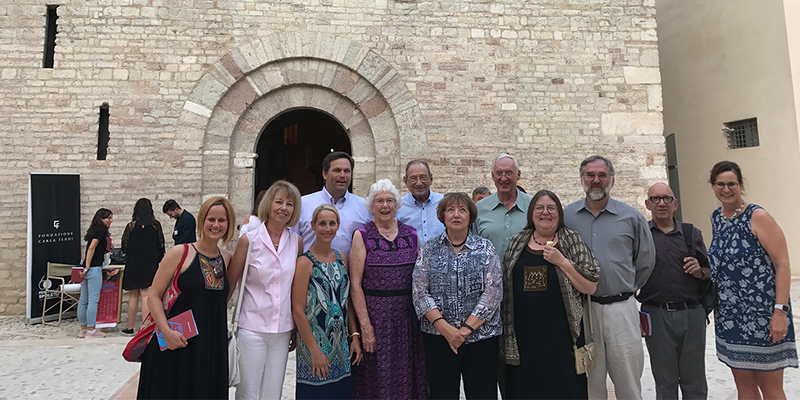 We saved exploration of the town of Assisi for last – where St. Francis of Assisi lived and left one of the most important spiritual legacy’s anywhere in the world. The incredible UNESCO World Heritage Site of the Basilica of St. Francis draws pilgrims from around the world, which includes the Franciscan monastery there as well as lower and upper churches of St. Francis that were begin immediately after his canonization in 1228. With frescoes by Cimabue and Giotto, it was very difficult to leave. We also discovered the beautiful churches of Santa Chiara and San Rufino, with massive buttresses, rose windows and both Gothic and Romanesque styles. We packed in incredible amount into a week of Umbrian immersion – the food, culture, arts, architecture, history and local feel of being at a festival that is such a point of pride for the region and the country. It was also an opportunity to solidify friendships, make new ones, as well as reconnect with the essence of what we do at Meany Center. Not only does Meany bring artists from around the world to Seattle – artists that in some cases would not come to our region otherwise – but we build connections to the people, cultures and communities that the artistry is based in. I look forward to our next Meany Center exploration trip, and hope you'll consider joining us!